There were many leaders in the early church, but few were as humble and influential as Barnabas. His name was Joseph, but the apostles gave him the name "Barnabas" (BAR nuh bus) which means Son of Encouragement. It was an appropriate name because he was an encouragement to all who knew him. There were thousands of Jews in Jerusalem who were converted on the day of Pentecost and the days following. They had not come prepared for an extended stay in the city, and yet many of them stayed on to hear the apostles' preaching. Their money was used up, and they became poor and in need. Some people who had property, sold it and gave the money to the apostles so they could feed the multitude of needy people. One of those who sold a field was Barnabas from the island of Cyprus. He was a Levite. According to the distribution of land when the Israelites entered Canaan, the Levites were given cities and pastureland around the cities for their cattle. The pastures extended 3,000 feet (over half a mile) in all four directions from each Levite city. Barnabas sold a field he owned and brought the proceeds to the apostles. Peter, since the Lord had given him the "keys" to the kingdom, was the one who first preached to the Gentiles. Yet it was Paul, whom the Lord chose to be his special preacher to the Gentile nation. When he was a new convert, Paul went to Jerusalem and tried to contact the believers there, but they were afraid of him. What if he was just pretending to be a believer in Christ? What if he was really just trying to find them and arrest them? Barnabas saw what was happening. He himself had the trust and respect of the believers, and he thought Paul was sincere. If he introduced Paul to the apostles in Jerusalem, the others would accept him. That's what he did. Barnabas told them how Paul had been converted and how he was now preaching about Jesus. The church accepted him, and he was able to stay in Jerusalem. Then evil men began to try to kill Paul and the brothers sent him to Tarsus. Later Barnabas would go to Tarsus looking for Paul again. He found him and brought him to the city of Antioch and the two of them preached in the city for a whole year. The Spirit sent Paul and Barnabas to Cyprus to preach. There they met a false prophet named Bar-Jesus or Elymas (EE luh mus). He was an attendant to the proconsul, the government official. He opposed their preaching, and Paul called him a child of the devil and told him that he was going to be blind for a while. mmediately he became blind and started looking for someone to lead him around. The proconsul was amazed and believed the teachings of Paul and Barnabas. The Holy Spirit directed the work of Paul and Barnabas, and they traveled to many cities preaching the good news about Jesus. In the city of Lystra (LIS truh) Paul worked a miracle in which a lame man was able to walk again. The heathen people of that city thought they were gods and prepared to offer sacrifices to them, but Paul and Barnabas rushed out shouting that they too, were human and were trying to get them to worship the true God. Barnabas was not one of the twelve apostles, but in this instance he is called an apostle, because he was sent by the Holy Spirit on a special mission. John Mark, his cousin, traveled with Barnabas and Paul to some of the cities, but he deserted them in one city and failed to continue the journey with them. 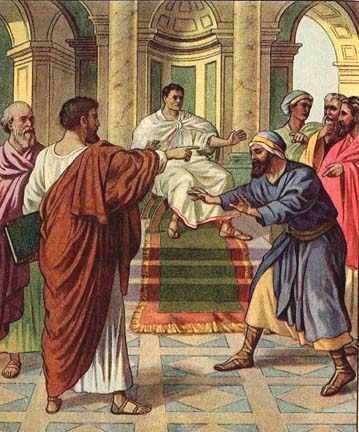 This incident would later cause a problem because Barnabas wanted to again take John Mark with them, but Paul refused to take him. There was sharp disagreement over the matter. Paul was reluctant to take a chance on John Mark, but Barnabas, always ready to encourage, wanted to give his relative a second chance. They settled it by parting ways. Barnabas took John Mark with him to the island of Cyprus, and Paul took another preacher, Silas (SIGH lus) with him through Syria. They agreed on this compromise and God's work continued. There is an indication that Paul and Barnabas worked together again, and in his letter to the Colossians which was written from prison, Paul mentions the fact that John Mark is with him, and he tells them that if John Mark comes to the church, they are to welcome him. Barnabas was truly the Son of Encouragement who always looked for the best in people, and his faith in them was rewarded. Barnabas was called "Son of Encouragement". We all need to be encouragers of others. Suppose a new person comes to your school. You can be a friend to that person. Talk to him (or her). At lunch time go and sit with that person, or invite her to join you and your friends at your table. At recess time include the new person in your activities. Welcome him on your team even though he may not become the best player on the team. Be helpful and show him where things are at the school, and tell him what is expected of students. Help him to learn his way around. English Bible Activities Select story #256 in the list for activities to accompany this Bible story. Spanish Bible Activities Select story #256 in the list for activities to accompany this Bible story. Very helpful! Bless you all for providing! this website is beautiful... it had help me as sabbath school.. Thank you so much. So helpful - loved it - thank you very much! This page displayed 131,797 times.